Nanōmix is the leader in the development of mobile, affordable point-of-care diagnostics. We offer a handheld testing platform and assays that provide rapid, accurate, quantitative information for use in settings where time-to-diagnosis is critical to clinical decision making and improved patient care. Our goal is to expand access to quality health care by bringing diagnostics to the point of initial patient interaction, whether in the hospital or in pre-hospital, remote, or alternative settings. 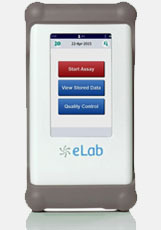 Performance equal to a central laboratory system in a handheld, mobile device. Nanōmix, Inc. All Rights Reserved.